it wasn't what he needed. Avila was able to continue, but there was a hole in the Carlin Dallara's nose, so he needed to pit for a new one; to add insult to injury the officials blamed Avila for hitting Lei, claiming that he had ignored yellow flags. They fined him $3,000 dollars, which seemed a bit harsh. No matter how much he'd slowed, Lei was manoeuvring across the track so it seems unlikely the youngster would have missed his fellow Macanese unless he'd actually come to a complete halt. Anyway, the session was eventually restarted and once again it was a while before any changes started to happen. They came, as expected, from Hamilton, who was now in the 2.13s, from Green, and from Nico Rosberg (Team Rosberg) who suddenly banged in a quick time to go 3rd. Another good effort from Green saw him improve on his time from Thursday's effort, and he was among the first to do so. Alexandre Premat (ASM Formule 3) was now beginning to show at the front of the order too, the quiet Frenchman slotting in to 4th. Meanwhile, his teammate, Eric Salignon, was still struggling, having crashed out of the first qualifying session. It's debatable whether Eric should be back in a racecar at all, after a serious car crash earlier in the year. He seems to have not quite shaken the after effects off, and it's questionable whether he really should have been passed fit to race. He's a street race specialist and could only manage 18th so far. Hamilton, meanwhile, was flying with another 2.12. To prove it wasn't just a case of Hamilton being fast, his teammate promptly joined him on the front row, snatching 2nd. With everyone beginning to bring their times down it looked like we might be in for some very quick times, but then we got another series of incidents, starting when Marko Asmer (Carlin Motorsport) hit the wall at Police and had to be craned away. The debris from his accident promptly caught out Franck Perera (Prema Powerteam), who also hit the barrier. While all this was going on, Kazuki Nakajima (TOM's) had started to show signs of speed and was 5th. However, with debris on the track and yellow flags everywhere, most people opted to pit for new tyres while the rubbish was removed. With 19 minutes remaining, almost everyone was in the pits, and the order was now Hamilton, Kubica, Rosberg, Green, Nakajima, Richard Antinucci (TOM's), last year's pole position man Fabio Carbone (Three Bond Racing), Premat, a rapidly improving Nelson Piquet (Piquet Sports) and Danny Watts (Hitech Racing). 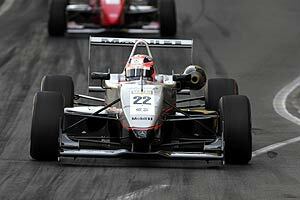 Meanwhile Alvaro Parente (Carlin Motorsport) was able to improve to go 12th. However, it all went pear-shaped yet again with 15 minutes of the session left. This time it was Salignon, crashing at the same place as on Thursday, thus ending his session prematurely again. This time he hit the wall at Maternity, because he was attempting to get out of the way of Kubica, who was on a quick lap. He also ended the session again, as the red flags were hauled out again. By the time they got going there were only really 12 minutes left to try and set a time. Marchy Lee (Meritus) was the next to mess up the session, clobbering the barriers at the ever-popular Police (Moorish Hill) and having to be craned away. The marshals were beginning to look very tired, but were still performing very efficiently. There were improvements soon afterwards from di Grassi and Carbone. The former was still only 19th, while the latter was clearly after another pole and was 5th. Almost immediately afterwards, Carbone baulked Hamilton badly, which caused the Manor driver to hit the wall at Dona Maria, damaging the car. Limping round, he had some difficulty negotiating the Melco Hairpin, and got stuck, taking Adam Carroll (Menu Motorsport) and Michael Ho (TME Racing) with him. In addition, Green had torn a wheel off his car, and there was debris all over the place again. This was rounded out when Nakajima failed to get round Fisherman's Bend cleanly, and cannoned into the wall. The car shed parts in all directions, and again the session had to be stopped. At this rate there would be no cars left by the time the chequered flag came out. However, the big story came just before the incident involving Nakajima. After a dreadful day on Friday, when he made numerous mistakes, Kubica put it all together and snatched pole from his teammate Hamilton. In a display of Manor solidarity, the Pole was on pole! The order now was Kubica, Hamilton, Rosberg, Green, Carbone, Nakajima, Antinucci, Premat, di Grassi (who was at last finding some speed from somewhere) and Piquet. And so, with enough time left for one flying lap apiece, what was left of the field was turned loose on this unforgiving street circuit once again. OK lads! One more time - but with a bit less feeling please! It proved to be worthwhile both for Piquet and Antinucci. Piquet rocketed back up the order to finish in 5th, just behind Rosberg. Antinucci, on the other hand, pulled out a great lap to grab 3rd just as the session ended. He was still disappointed afterwards though, feeling sure that his aborted lap before the last red flag had been good for a 2:11. Of course a driver's "next" lap is always going to be his fastest one, but this time he might even have been right. And so Kubica and Hamilton locked out the front row for Manor, with Antinucci ahead of Rosberg, Piquet, Green, Carbone, Premat, Nakajima and di Grassi. Saturday's qualifying race should prove interesting.